Probably one of the most beautiful birds the heavens crated for humans are the hummingbirds. They come in beautiful colors – all hues in the rainbow—and produces the most beautiful bird sound, that many calls them songbirds. They are however very elusive little birds and more popular for their uncontrollable appetite for nectar. 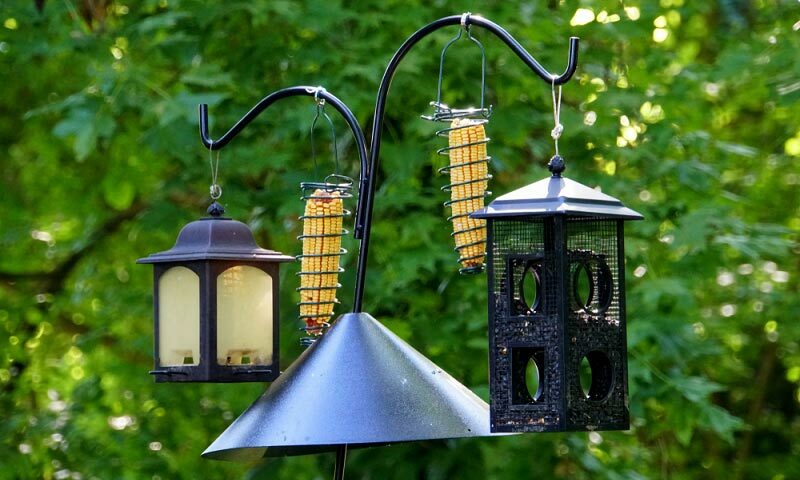 For this, getting them the best hummingbird feeder might be the best way to go if you want to keep them in your backyard. Of course, getting a feeder may not be as easy as picking up a soda at a nearby store. There are many things to consider, including whether or not, they can keep the feeder and the nectar protected from nature’s harsh elements; wind, rain, sun or from the predators lurking around the back yard. 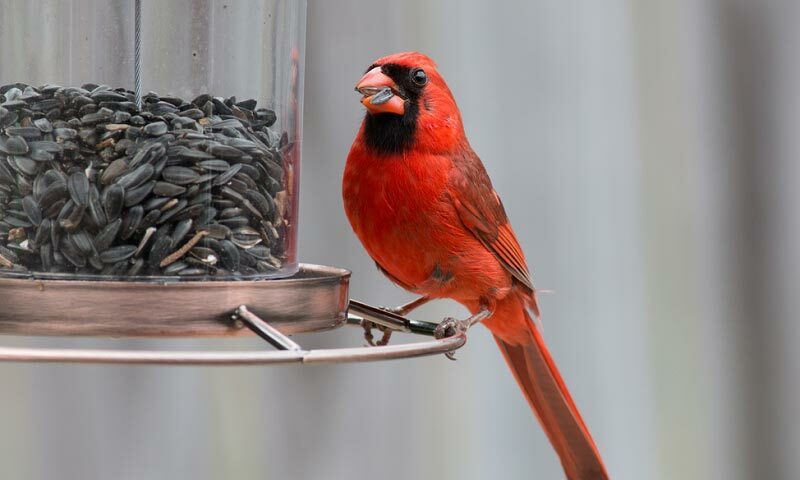 It is no secret that keeping them stay or keeps coming back in your backyard may not be easy but no fret, there are many ways you can let this beautiful birds put a smile on your face when you drink your morning coffee and watch them feed on the nectar in their feeder. The first step, however, is to get that feeder that works best. Here are some of the most popular feeders you can choose from. Yes, a colorful one to complement the colors of the birds. What better way to treat the birds than providing them a beautiful and practical feeder to enjoy their eating time? Certainly nothing. And good thing Aspects has just the answer to that. The feeder includes a perch allowing birds to rest comfortably during feeding, they get to drink from the four feeding ports and gives the watcher the best view there is. This makes this products possibly one of the best ones for hummingbirds, and the reasons why I like it too. The material, unbreakable polycarbonate provides a functional but a feeder that is long-lasting too. That makes it even more a delight to have this one in the yard. Well, that is aside from the fact that the red color is good enough to attract the birds to come over. No wonder expert bird watchers have rated this a five. 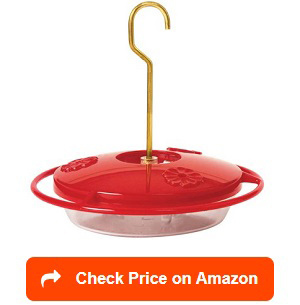 I recommend this feeder without a doubt to anyone who likes hummingbirds. As usual, I will always have a soft spot for perky-pet products because of the quality products they produce so far. 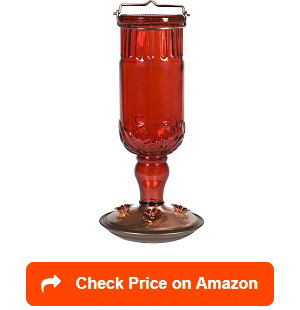 Once again, they created a beautiful glass style nectar feeder, a red one at that, with copper finish that can hold at least 24 oz of nectar. I recommend this products for its three major features: the glass container, the perching area and the amount of nectar it can hold. Because the design is elliptical, you can have an unobstructed view of the feeding birds. It is always great to watch them from afar, perching, flying away, and coming back again. Meanwhile, the cylindrical design allows the nectar to properly drain until the bottom, without wasting a single drop. Because of the size and shape of the birds’ beaks, it is advisable that they won’t have to drink from a flat surface as they will have a hard time doing so. Because the flow is continuous, the only possible problem will be the feeder bottom getting too full. 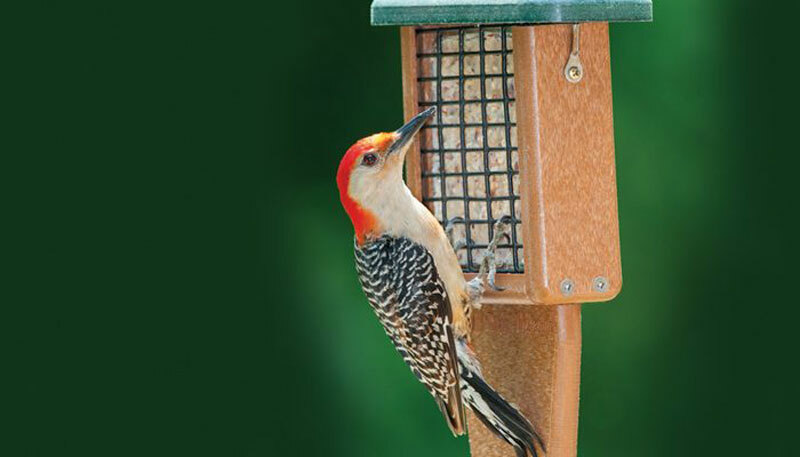 Calling themselves ‘first nature’, I wouldn’t be surprised that the feeder is indeed something that complement any yard. 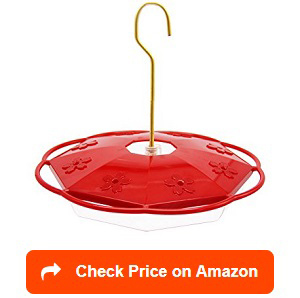 The bright red hummingbird feeder 10 feeding ports are adorned in yellow flowers. I like this feeder because of its capacity and functionality. It can carry 16 oz of nectar, enough to feed a whole flock of hummers. It is also has built in ant-moat so the nectar inside will never be ruined. Of course, the natural elements such as wind and rain or even snow are other considerations. Yes, it is no secret that hummers like colorful objects so the bright red color is all you need to ensure that you get a steady stream of beautiful hummers in your yard. I am recommending this feeder because of its wide-mouth reservoir and patented two-part base that makes it easy to both clean and fill. Also, the feeders’ polymer material is durable that it can actually last a long time. 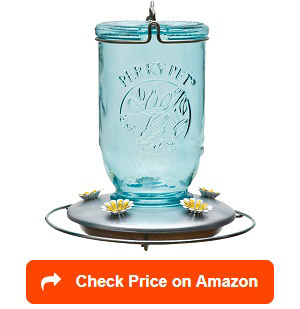 The only downside of this almost perfect feeder is that there are still left over nectar at the base even if the jar looks empty. Make sure you clean them up before filling it again. There’s something about hummingbird feeders that all bird watchers can’t get over with. It is the fact that so many of them are artistic feeders. 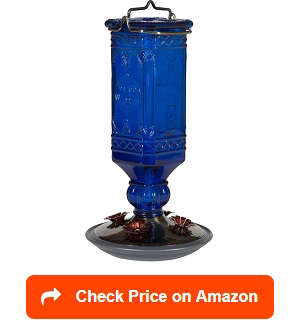 Take this feeder in vintage antique bottle made by More Birds – a beautiful addition to any backyard. Aside from design, I like this feeder because of few other reasons: large capacity and its attractiveness to hummingbirds. Being elusive kind, hummers are attracted to the red flower ports surrounding the perch. 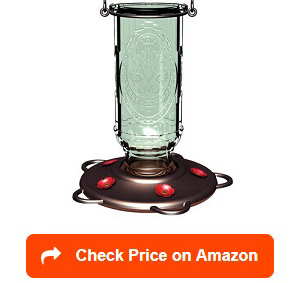 Since it is made of glass, the nectar container is obviously a great investment. It is clear so it easy to know when it’s empty while its wide mouth makes easy fill and ultimately easy to clean. And who does not like a 20 oz. feeder? Probably none. Hummers will be trooping for he nectar and watchers will surely have the best time of their life. 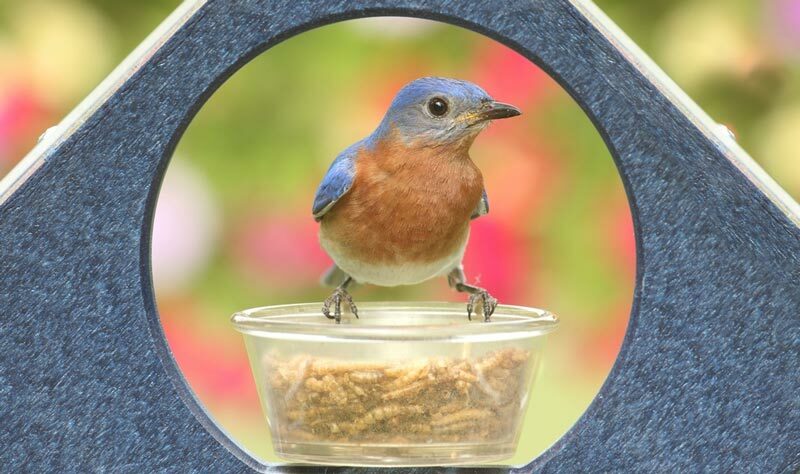 The basin is made of metal so that makes this feeder one of a kind. Have you ever heard of the term small but terrible? This is probably it. It maybe small but very friendly and attractive to hummers. The glass bottle container, positioned upside down is a good way to make sure no nectar is wasted. Since it is container tight, wasps or bees have no way of ruining the contents – yey to keeping the nectar for the intended users – the hummers. No wonder birders rated it high. A simple but elegant looking feeder. I like window feeders for some reason. Watching the birds early in the morning while sipping hot coco is the best way to start the day. The little competition over nectar (or in some cases, seeds) is a joy to watch. 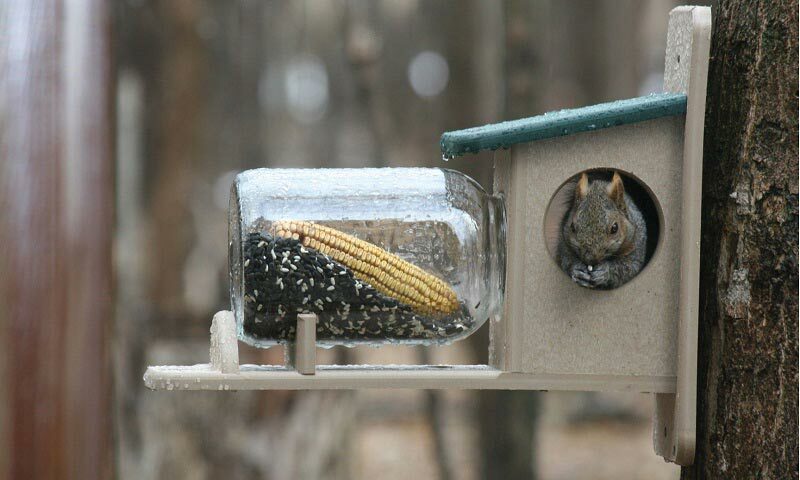 The clear window feeder is practical and easy to use. The plastic design from Aspects brings hummingbird in many colors right at your window – making viewing really easy and great. I also like it because it is great as a window decoration. It complements the clear window very well. The three feeding ports is also great for use – just enough to enjoy the bird visitors. It’s capacity of only 8 oz gives you total control of how many comes into your yard everyday. Why buy one when you can get two. Yes, with the increasing number of hummers coming by during the summer, there is a need to have more feeders to accommodate all feathery friends. It is great to have red base, which attracts hummingbirds without a doubt. The wide-mouth reservoir makes filling and cleaning easy. The cylindrical shape makes it easier to spot when it need filling too. One of the best features is the perch area, which gives birds the chance to be relaxed while feeding. With 10 feeding ports, there’s enough space for every hummers, making it such a nice experience for our feathery friends. Elixir means life and true enough, this glass hummingbird feeder created by More Birds is doing its share making sure the birds are well-fed all throughout. 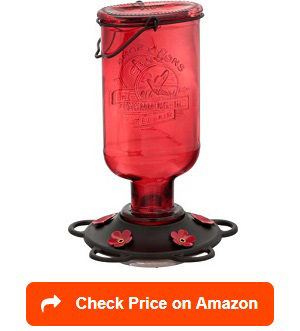 The capacity of 13 oz makes it ideal for birders in areas populated by hummers. Personally, I love the simplicity and functionality of this product. The glass container is intricately done that will surely draw attention to both hummers and humans alike. It’s beautiful design is completed by the 5 flower pattern designs. Beautiful and practical sums up this feeder. Its wide mouth makes it for easy filling. Definitely, the low cost also adds up to the things that make this feeder way better than others. The metal perch makes it a very sturdy feeder as well. 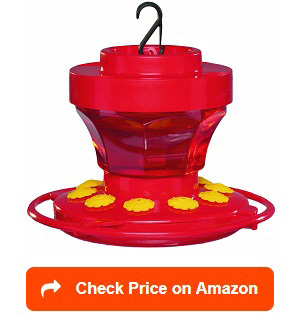 With the many great things about this feeder, I am not surprised why many expert birders gave this product five in the rating. Are you for cute stuff? Hummingbirds are surely cute birds and they are so fascinating that they can fly about nonchalantly showing off their beautiful feathers. Hence, caring for them becomes a necessity. The best way to do is ensuring that they are pampered with their garden and the food they take in. For such purpose, the 12-ounce hummzinger got the zing. It has built in ant moat and assures every birds a good time. While it looks small, it has 4 feeding ports making hummer friends happy during their feeding time. The beautiful raised flowers also protects the nectar from the rain so you got clean and fresh nectar all the time. Because it is a dish, it is easy to clean, refill and maintain. With all of these, it is no wonder birders like it so much. While this may look exactly like the Aspects hummzinger, the similarities end there. This 16 oz capacity dish feeder by Juegoal is a treasure on its own. I love that it has a larger capacity, which means constant refill is not necessary. It has also 8 feeding ports, located on its perch giving everyone a great time while feeding. A well protected cover and a hanging rod to make things easier for the birder. Also, the dish quality makes it practical to clean and fill. The only downside is probably the fact that it is made of plastic hence exposing it to the hot sun may not be a good idea. Keep it under the shade on mid day. Aside from that, it is worth every dollar and even expert birders rated it a 5. Perky Pet is always on the run for good products. I just love their new blue glass feeder for many reasons but the aesthetic value of it is probably on the top of the many reasons. Of course, the same product line also comes in various colors. It is fascinating to have them at the backyard and combined with the luscious colors of the hummingbirds. Watching the birds feed on the nectar has never been this great with such beautiful product. Yes, I recommend it for sure. The 16-oz nectar hardened glass antique bottle is for keeps. Its four decorative feeding ports, small transparent flowers, adds creativity to the entire material. Its brushed silver base is perfect for perching, which is also detachable hence it is easy to clean. Its sturdy bottle is perfect for the garden. The more even body of the bottle makes it very attractive for the hummers. The only downside of this product is the fact that the blue glass coating may start to come off after years of exposure to the harsh elements: air, water, snow. Still, it is a great feeder to have in the yard. I love mason jars. Their design is always something I am interested in. Yhey are also multi-use whether inside or outside the kitchen. This is why I like this feeder. It is providing me with the same satisfaction of using the glass mason jar. It’s embossed details add up to the character that makes it a bottle worth keeping. The embossed yellow metal flower feeding ports are also great the hummers love it. With 5 feeding ports, there’s plenty for every hummer in the area to feed from. To make it more sturdy, Perky-Pet added on a galvanized metal based, circular in shape to ensure that birds will have a relaxed feeding time. This can be the only bad thing about this product though as galvanized materials tend to rust after sometime. 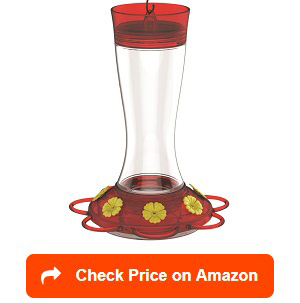 In areas where hummingbirds are a lot, the 32 oz nectar feeder is perfect for the yard. This means less time to refill yet more time for feeding. Because the major jar has wide mouth, cleaning comes easy. You can even pop it in the dishwasher for an even easier way. Big capacity for nectar, 32 oz. 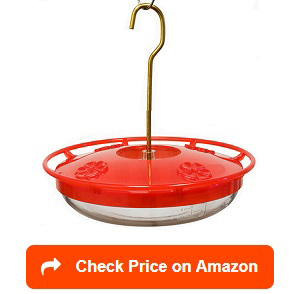 There’s nothing more friendly than a feeder that is both cheap yet sturdy enough. This is the beauty of the hummingbird feeder made by First Nature. While it is made of plastic (not glass like many on the market), it is strong enough to withstand the harshest of elements including the searing hot sun or the coldest of snow. I like it because of its ease of use. The wide mouth reservoir makes it easy to fill and also to clean, which are the two most important aspect of owning a feeder. The polymer component of the feeder is durable so you don’t need to worry about it for a long time. It also features 10 feeding ports with pretty yellow flowers. What more? The feeder is in bright red making it very attractive to the hummers. You sure will never run out of birds during the birding seasons. To answer to this need, it can contain 32 oz of nectar, enough for a few days. To prevent leaks, an innovative ring is provided so you won’t need to worry about wasting a drop of nectar. With a price that is very affordable, it is no wonder that even the best birders in the country rank it as high 5. Every birder knows that the hummingbird is the smallest bird variety or specie in the world. They are so small that they need, yes, special treatment –including their food and their feeder style. They are however famous for their aerial display. Their ability to fly all ways is the reason why they are birders one of the most favorite to care for. With the same ability, it means that they need more energy, which means more food – constantly. Thanks to this glass feeder by More Birds, there is a way to make every hummer happy and cared for. It carries enough nectar to last for few days, keeping your hummingbird full. I like this feeder because it is not only sturdy but because of its capacity. It is nice to have a glass container that keeps a big amount of nectar safe from ants and wasps while keeping it fresh. The perch and feeding ports are decorated with flowers on a brushed copper finish, adding both elegance and functionality. Copper can withstand the harsh elements keeping if from rust and damage. Its wide mouth makes it easy to fill and clean. Since it is mass produced in China, the price is way lower than many feeders in its category, without lowering the product quality. Despite such, this product is rated high by most birders. It is both practical and functional so I am highly recommending it too. Perky Pet definitely did it again. This beautiful glass, in light rose color, is just great to have in the yard. The company even claimed it as not your ordinary feeder and I agree with them. This outdoor vintage glass feeder complements a country like design yet modern enough to inspire even the most-picky hummer. Such a display will surely add aesthetic and functional value to your birding hobby. I like the vase like curves, an addition to its overall display of authenticity also carries 24 oz of nectar, good for few days of feeding. 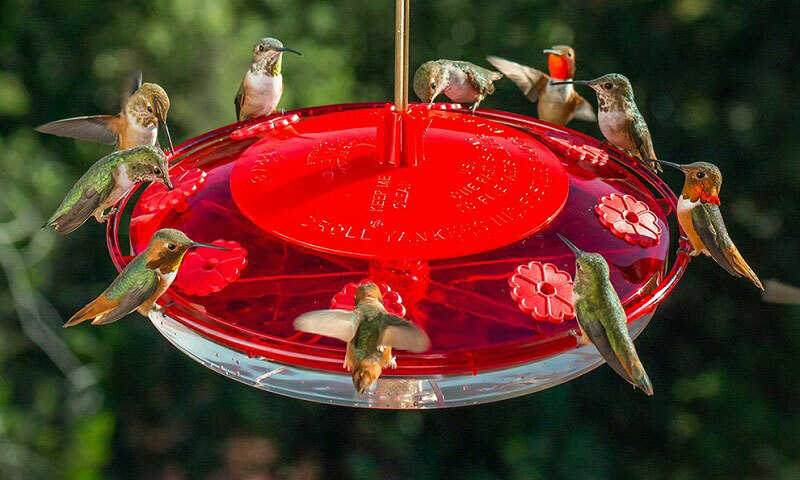 This is a glory for hummingbirds – a perfect feeder for these beautiful birds. And yes, you can look at a chic display at your yard while the hummers are enjoy their nectar from this cranberry vintage glass. The decorative top loop makes it easy to hang in the most conspicuous place, for great viewing display. Unlike many others, the bottle has daisy flower ports adding character to the already nice feeder. If there is one backlash of this product, it is perhaps just the washing off of the pink colors. Except that, everything works perfectly well. It is one of those rare moments when you wish you can concentrate on the birds. The pretty hummingbirds are so cute that you may want to watch them up close with little worry about overcrowding. There are many reasons why the hummzinger feeder by Aspects is worth all the investments. It is not just pretty but very functional as well. It is your ultimate guide to enjoying the hummers more often. The smaller capacity makes it easy for you to have more of them at your yard, which provides varieties of birds to come over. This is good for many reasons. It is nice to have few of them for the birds to visit and feed on. 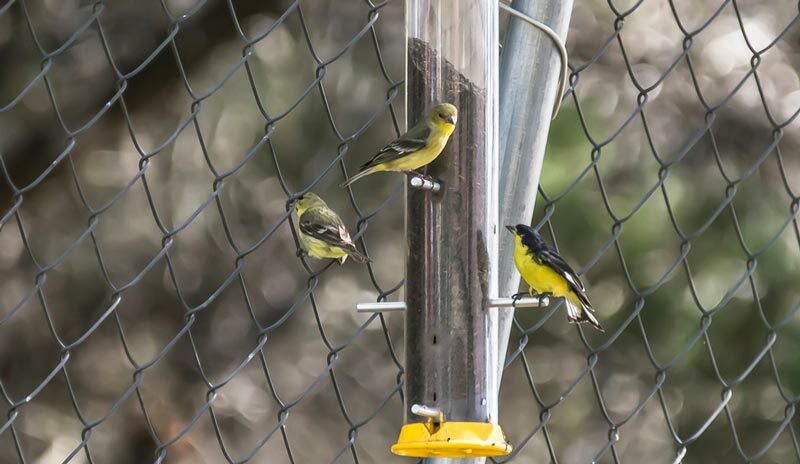 The feeders polycarbonate construction also provides the birds the time to sit and stay awhile. 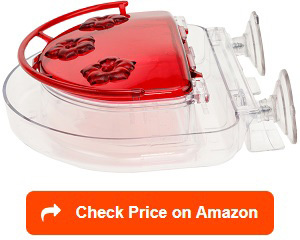 I like this feeder because it has built in ant moat so your nectar is safe all throughout. It can also be mounted almost anywhere: a tree branch, a bar, a pole or even the porch. Another good thing about this feeder is the design of the raised flower, which divert rain, keeping the nectar fresh all throughout. It does not drip and leak so its perfect for outdoor feeding. It is generally a sturdy product except for the plastic perch, which may turn bad, brittle or flimsy when exposed to elements. I have seen many feeders but not as beautiful as this one. This is perhaps the most perfect of all the feeders available nowadays. The red over all provides the attraction the hummingbirds need – strong colors. I love the overall look of this feeder as well as the easy-to-fill features because of its wide opening. What more? The four flower feeding ports are but just perfect for birds. It has removable perches that protect the bird from being stressed out while feasting on the nectar. The ant moat property also protects the nectar from invaders – wasps, bees and ants –keeping it fresh all throughout. It’s wide mouth makes for easy filling and cleaning. And its red bold color makes everything just great. Birds will come flying through just minutes after its placed on a pole or a tree. While the design is great, the material, made of strong plastic can not withstand the heat of the mid day sun during hot months. There’s a slight melting, which can result to some leaking after some time. A simple fix from a shop will do but it is still might need some re thinking where to hang it. Under the shade should solve the problem. It’s one of those feeders you wish to keep to yourself as it would be too pretty to share. 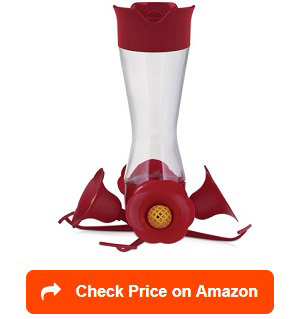 I do not regret recommending this product as I am sure you would love it anyway – every birder would. The vintage vase glass is a gift to any bird yard. It is beautiful and deeply attractive to hummingbirds. Its red luster finish glistened in the sun adding character to your yard especially during the birding season. It is big enough to contain at least 24 oz nectar, which will save you from filling it up for few days. I also love the red daisy design on its four feeder ports. The raised daisies protect the feeder from ants, wasps and even from the rain. The perch area is also very ideal as it gives the hummers the chance to feed stress free. When hanged at a place easily spotted by hummers, they won’t be able to resist the charming glass reservoir of their nectar lifeline. It is no wonder that expert birders gave this product 5 in the scale. 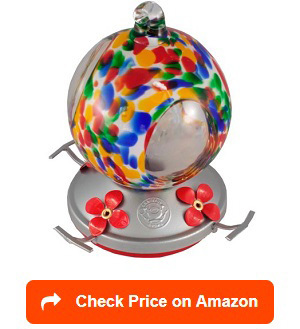 Many claimed it is sleek, sturdy and certainly a perfect ornament for every bird yard. If there’s one possible flaw then it is probably just because it only has four ports, which means it may not be enough to feed the many birds attracted to this red gem of a feeder. There’s always the first time for beautiful products. And this one made by Great Genome is probably the best definition of one beautiful feeder. This beautiful hand blown glass is worth every dollar as its colorful design add vibrance in your backyard, complementing all the colors of the hummers. 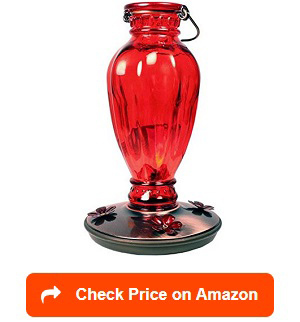 Among all the hummingbird feeders available, this one piece thick glass can last for years yet retaining its colors. To make sure there’s enough for every single feathery friends out there, Grateful Gnome provided 5 feeding ports of beautiful daisies, which doubles as a protection for the rain and other elements. I also like that they provided an S hook to make sure it is ready for hanging at a pole or a tree branch. Things are surely easier for birders out there and more fun for the hummingbirds as well. Imagine the blend of colors –magical and surely a good way to watch them feast on the nectar during stressful days. With 24 oz of nectar, that’s a lot to keep them coming back everyday. With that much content though, it is important to seal and close the lid as tight as possible to avoid any drips. The base is a combination of copper finish and strong plastic base. What better way to attract and feed the lovely hummers than to give them both: red colored feeder and a 20-ounce nectar to feast on. As for your end, nothing but to sit back, relax and enjoy your morning coffee while delighted by these beautiful songbirds. Hence I love this feeder. It has the necessary requirements to be the best yet at the most affordable price you can get. On top of that, who does not love a feeder that is also very easy to clean.One thing I hate doing especially during the cold winter months will be to come out and refill because my hummers are hungry—who loves it anyway? With More Birds invention of this feeder, I think my decade long problem of ant, wasps and even molds have been answered by this feeder. This is a special feeder but More Birds has plenty of designs one can choose from. But personally, with 7 ports, I would be happy to see as many hummers in my backyard than anyone else at a given day. They surely add more excitement to my already active bird yard. Plastic cap may change color after sometime. Exposure to harsh elements. 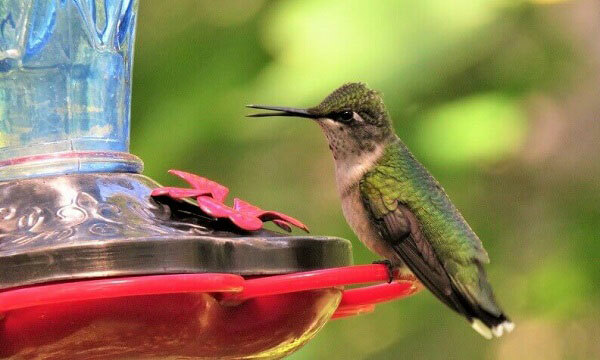 Feeders for hummingbirds are different from any bird feeders, both in design and function. 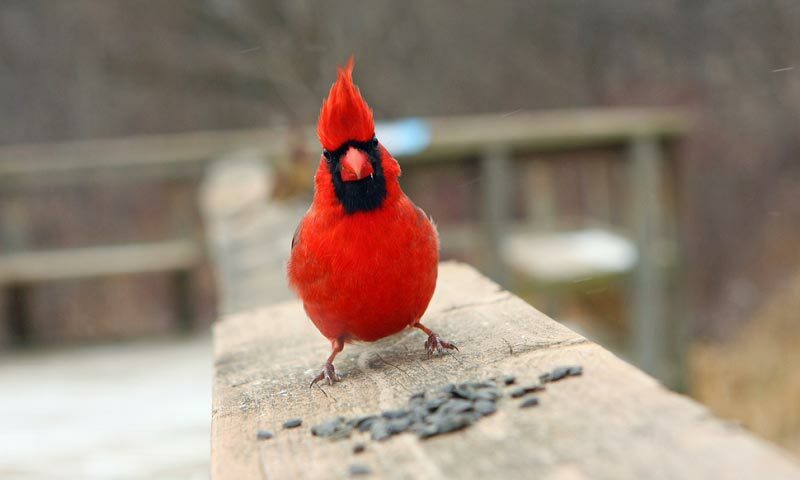 First, the bird food is totally different. While most birds feed on seeds, hummers specifically require the sweet nectar. First designed by Laurence Boston sometime in 1929, the glass tube based design became a popular hit for hummers today although it has developed into many shapes and sizes. Many birds needs solid food such as seeds to survive but hummers need nectar to power the “bug eating machine” they are known for. Well, this are in addition to the real bugs and flower nectars they take in along the way. Any nectar containing feeder attract a hummer so two things to look closely when buying one will just be: easy to assembly and easy to clean – all the rest, colors, location come second. 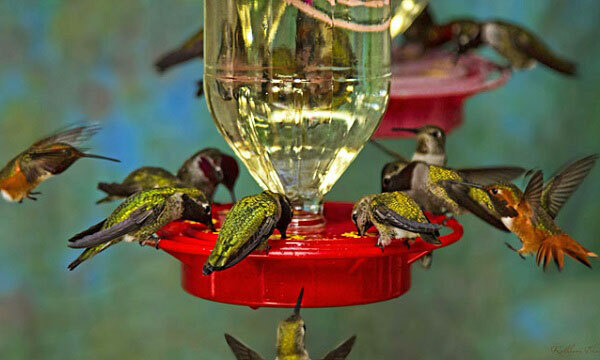 What’s great about hummingbird feeders? Only hummers get to them to place it as far as you can from others and you get only the most beautifully colored songbirds without a problem. Feeders work the same way. Or so we were told, except when you become a serious bird feeder, then you probably need more than that. Yes, you will have to experience more than just putting seeds or nectar or water for the birds. Hummingbird feeders are quite unique and why not when the birds themselves are unique too. So what makes it Different from the rest? Let’s consider what’s inside the feeder. 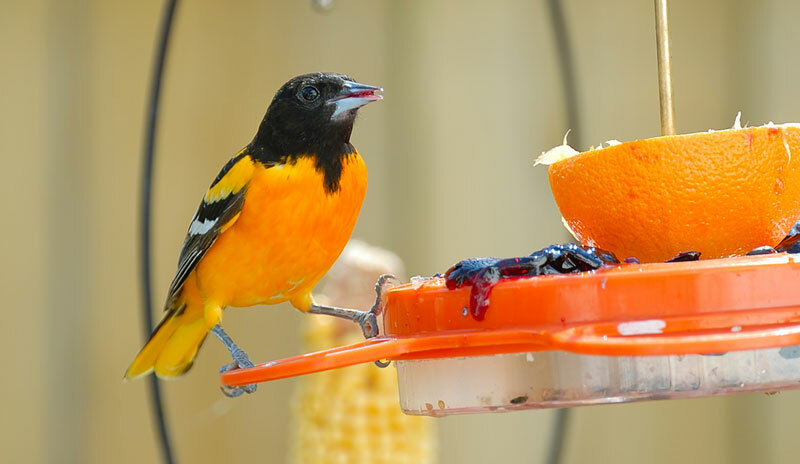 Unlike birdseed feeders, nectars need a vacuumed container. This means that it can’t be exposed to air, water or sunlight. This briefly explains why they all come in sealed glass or strong plastic containers, all has little to no gas – sealed well to keep the nectar flowing properly. When the hummers are done with feeding, the fluid will stop flowing. Technically, the flow of the nectar stops when the atmospheric pressure equalizes with the pressure. If it is not clear enough, here’s the shortened version. The nectar stops flowing hence no leakage or drips. 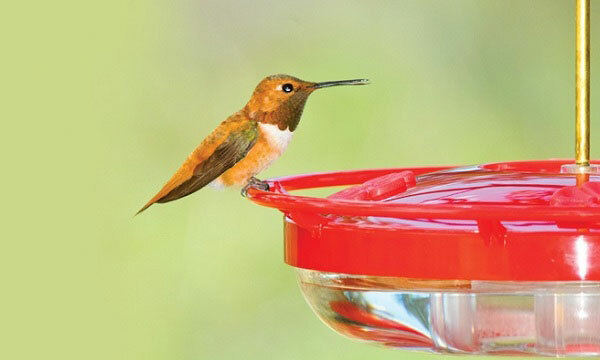 Base from popular feeders available on the market whether online or offline, there are a total of three categories for hummingbird feeders: the study plastic flat container; the pretty window feeders and the glass jars that can come in many unique shapes and sizes. However, more than looking at the design or types, it is important to know few things that are relevant to your buying decision. These few include the account of the hummingbird population in your area, places to hang or if you wish to see the colorful hummingbirds in action. Too many hummers. If you know that is a large number of hummer population in your area, choose to have the hanging glass containers. You can choose to have the 24 oz to 32 oz sizes, which normally comes in multiple ports. Having such type of feeder in your back yard ensures a steady supply of food for the hummingbirds as well as save you from constant refilling. While cleaning and filling is now made easy for many feeder type, it can still be a daunting task during the snowy months. 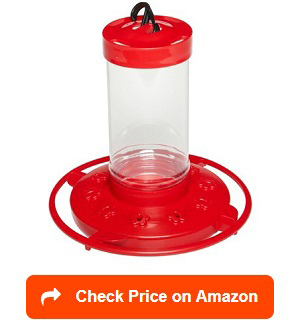 Most of the well designed, well-vacuumed hummingbird feeders are in uniquely designed glass jars. Beautifully designed. Some birders like the idea of adding aesthetics to their yard. If that is your goal, then the flat or dish containers made of sturdy plastic is your best choice. They are beautifully laid out, does not use a lot of space and can be hung anywhere. The top cover is usually decorated with flower feeder ports as well as it can be used for perching. Nothing can go wrong with this durable feeders. The Window View. I like the idea of waking up to the soft sound of the hummingbirds on my window while they are having their morning feed. Watching them from a clear window feeder is relaxing and mesmerizing. It is worth every dollar to invest in one especially if you have a large, clear window. Again, the type of the feeder you intend to use depends on what use do you intend it to be. Either way, all nectar feeders feed only the hummers (and sometimes, the bees and the ants!). There are many reasons why birders choose to attract hummingbirds in their backyards. And for the many benefits that come with it, I am not surprised why the bird is such the in-demand specie among the many choices of feathery friends. Here’s two of the most common benefits of attracting and keeping these beautiful but elusive birds into your yard. Hummingbirds feed on nectar of their favorite flowers. When this happens, they rub their faces inside the flowers, taking in pollens and transferring them one flower to another. Flowers gain varieties because of this process. As such, you will have pretty flowers and beautiful birds all in your backyard. Keeping the insect population low. Hummingbirds do not only feast on nectar, whether it is from flowers or a bottle as they also devour pests and insects like mosquitoes, gnats, caterpillars and insect eggs. This choice of protein source is the solution to yards populated with undesirable insects and pests. So planting flowers is a good way to keep attracting the hummingbirds your way. While insects naturally comes when there’s plenty of bush or plants, the hummingbirds will be just as happy to be around as well. Vibrant plants are attractions to hummingbirds. Easy to clean. Make sure that the feeder is easy to clean and fill since it means you might need to clean the feeder every other day or for some perhaps once a week. Bee guards. Bees attack some feeders quite easily. Since hummingbirds feed on nectar, bees are not far away. This means that getting a feeder that has bee guards and gets rid of bees and wasps permanently. 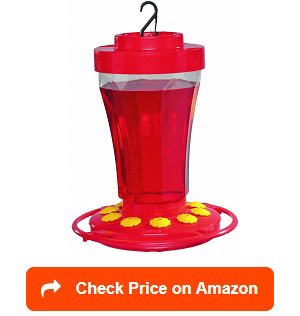 This plays a very important role in whether or not the hummingbirds will actually get attracted to your feeder. How much nectar can it contain, is the color attractive to birds and whether it is easy to install are just few considerations. But there are many others including whether it is a dish or a tube, flowers or ports, or even hanging or window feeder design. Dish or Tube. I personally like glass containers (or tubes) as they are vacuumed well leaving the nectar fresh and safe from moats, ants and wasps. Vacuum feeders are simply inverted bottles sealed tightly and the nectar ends up at the feeding ports at the bottom of it. When not sealed properly, there is a tendency to leak or drip. Dish feeders on the other hand are usually plastic containers with its cover acting as a perch and port. This kinds however are susceptible to ants and wasps. Flowers or Ports. This is another consideration. The feeding ports are important in measuring the success of your feeding activity. Incorrect port size will determine whether the hummingbirds can drink the nectar or the insects can go in and ruin the sweet goodness. Some feeders has flower designs, which also serve as raiser to protect the nectar against rain or mist. Window or Hanging. This is also a very basic consideration. Many small hummingbird feeders are made of plastic, which may get damaged after over exposure to sun or the wind or the snow. Glass feeders can become really hot under the sun as well. Knowing where to place them is important. Outdoor ones are advised to be under a shade while window feeders should not be directly facing the sun. Aside from these features, other considerations or factors include capacity, glass or plastic, design among others. Any problem with leakage? Is it bee proof? Let’s be honest. There will always be the tendency for a feeder to leak or drip especially for tube ones. Reading labels and reviews will ultimately guide you which ones of the many products for hummingbirds is perfect for your yard. Tube glass bottle can be problematic but they could be the perfect feeder too. This is why many bird companies have made adjustments to ensure that their products are leak-proof. The solution is simple: close the lid properly and tightly. Most tube/glass containers are vacuumed sealed so there is no way bees can join in the feeding time. Dish feeders have the tendency to be visited by bees and sweet loving ants. Where to buy hummingbird feeders? With the technology around these days, buying online is probably the best option. If you are the kind of birder who have been in the business for quite awhile, you probably know which among the bird companies are producing better products. In which case, Amazon or any other online shop should be your best buying destination. It’s a click and waiting game system. For newbies, it will be nice to leave your couch and drive to the nearest Walmart of Lowes. There are sales representative who can explain to you the features of each product and you can also approximate the size and capacity based on how big your yard, your house or even how many hummingbirds wander around your area. For those wanting to buy in bulks (too many hummers to feed), getting into the home depot is your best option. Since some feeders have limited ports, getting a few feeders will be ideal. With depot, you can buy them whiolesale. 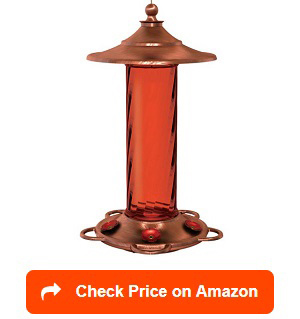 Where to hang a hummingbird feeder? They maybe small but they are very sensible. The hummingbirds know when you want to feed them gently and welcomingly or you just hang the feeder for decoration. Of course, every yard is different but knowing your birds will help you decide where to best hang them. Can they see it? Even if they are small, hummingbirds have very keen eyesight. However, a feeder perfectly hidden from their flying sight won’t get noticed. 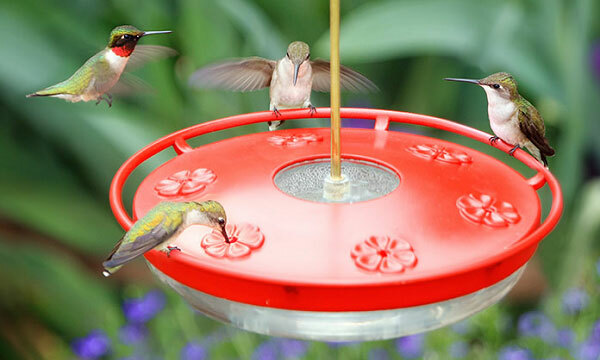 As a rule of the thumb, the feeder should be seen properly, reflecting lights or in bright red colors will let the hummers find it without much trouble. Yes, two of the most important factors would be whether or not the feeder is easy to clean and refill. No one wish to come out in the middle of summer or the middle of winter everyday just to refill. Glass feeders can be wash in dishwasher so that adds convenience too. Accessibility to the birder is also important. Aside from the birds finding it, it should be easy for you to get them when needed. Putting in your patio, under a nearby tree or a feeder pole will do the trick. Closer to view. The hummingbirds are a choice for a reason. Their colorful feathers as well as their songs are just some of the reason why they are well-loved. Putting the feeder within your eye sight or viewing sight will ensure a fun and enjoyable birding experience. 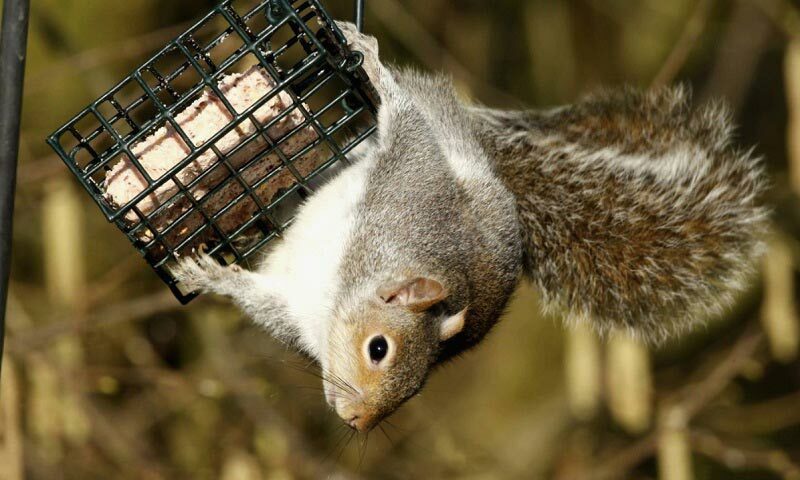 Most feeders are either made out of glass or plastic. Over exposure to elements such as rain, snow and sun may ultimately damage it. So keeping them under a shade will not only benefit the birds while feeding at daytime but will be better for you as well. No one wants to change their feeder every season. Enough feeders for everyone. Spacing between feeders will provide the birds the chance to eat comfortably. 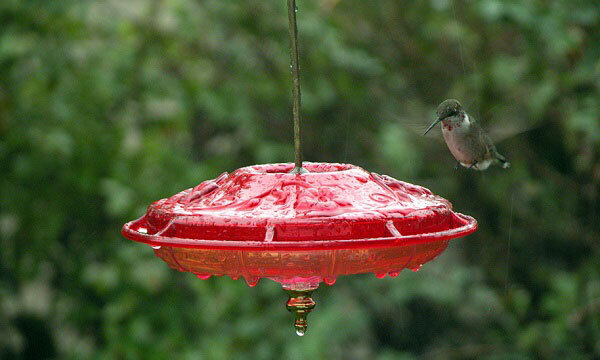 Having enough of the same feeder hanging in your garden also benefits the hummingbirds. Again, know how much hummers are there in your area. Other things include safety from other predators, privacy of birds during feeding time (do not hang it beside a birdseed feeder) and size of the feeders will all be consideration when finding that perfect spot to hang your hummingbird feeder. How to hang a hummingbird feeder? 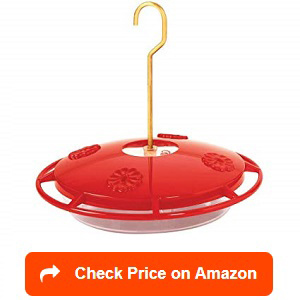 Most hummingbird feeder comes with an S hook so it is easy to hang it on a tree, on a feeder pole or on your patio. Some feeders can be attached to the window (suction provided). Depending on how you want to watch them, you should consider where to hang them first. One of the best way is to hang the feeder from a gutter of a gazebo and let the colored feeder sparkles when the sun reflects it but still shaded during the hot summer months. 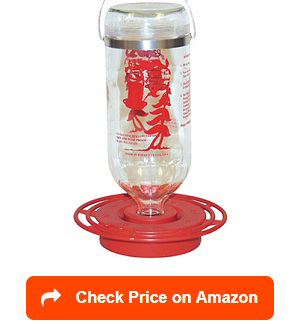 How to fill a hummingbird feeder? Hummingbird feeders are incredibly simple to set up. Because they use nectar, it is incredibly easy to clean as well. Filling it with fresh nectar is as simple as 1-2.-3. Remove the lid that holds the nectar, separating it from the rest of the feeder port and perch area. Pour nectar into your feeder chamber or tube. Depending on the size and number of expected bird visitors, you do not need to fill the nectar all the way to the top as it may go bad. Reconnect your nectar tube, glass, chamber into the lid. Make sure that the opening is facing up to avoid spillage or leaks. Screw the whole chamber with the feeding dish or the ports and perch portion. It is now ready to use. How to make hummingbird feeder tubes? There are many hummingbird feeders available in the market nowadays but there’s nothing more rewarding than making your own sometimes. Personalizing your feeder is a good way to control the features or design it according to the needs of your yard and of your hummingbirds. The best way to do is to choose the correct bottle size – mason jars, nice vase with lid will work as well. Make sure that it has a wide mouth for easy cleaning and filling. This will be the removable nectar reservoir. You need to add a base and open few spaces for ports. If you can, add a perch to make sure the birds eats in comfort. How to make a hummingbird feeder liquid? Boil 1 cup of water in a pot. Once the water is boiling, add 2.5 refine sugar. Mix the sugar until it dissolves into the water. Do not use any other types of sugar or sweeteners as they may harm the hummingbirds. How to clean hummingbird feeders? Birds do get sick and like any other mammals, they can get sick from bad food – in their case –rotten nectar. Molds and mildews should be avoided at all times. Hence, proper and regular cleaning of the feeder will be necessary. For starters, always rinse the feeder with warm water every time you need to refill it. Do not wash with soap as it can be harmful to the birds. Regular cleaning will need more process. Here are the easy steps to keep your feeder clean. Empty the bottle up to the last drops of the nectar. Nectars after feeding normally accumulate molds. Even if it looks a lot, do not save or re use contaminated nectar. Separate the feeder parts. This means possibly unscrewing the base, the bottle and the perch, if any. Use proper cleaner. Since strong chemicals can harm the birds, use more natural ones such as vinegar or hydrogen peroxide. If you see molds, you can use a brush to remove it. Do not use detergent soaps. At the most, you can use mild dishwashing liquids. To ensure it is thoroughly clean, you may boil it for few minutes. Sterilizing it will ensure bacteria are dead. Once cool, scrub any unnecessary residue or dirt that can contaminate the new nectar. Rinse the feeder completely and let it air dry before refilling it. 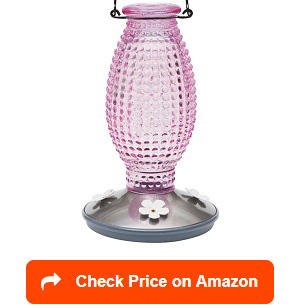 Can I put my hummingbird feeder in the sun? 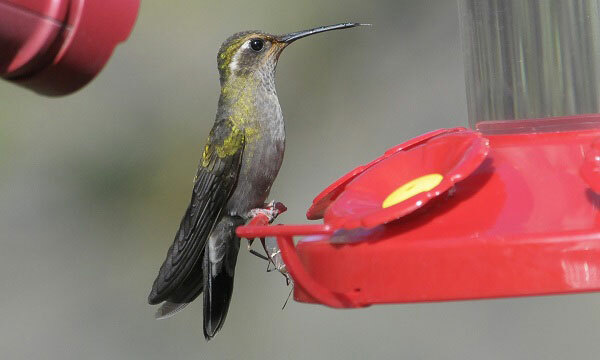 Unlike birdseed feeders, hummingbird feeders purely require nectar. And unfortunately, nectars react to too much heat – it can heat up spoiling the rest of the nectar. During the summer, it is advisable that hummingbird feeders are all protected under a mix of sun and shade. Perhaps, a tree branch or a patio will be a good place. Hummingbirds are prickly birds. They can be really sensitive to a lot of things, including what is in your garden. Once settled in, however, they can be seriously aggressive and territorial. But who can’t resist their beautiful colors? None. Here’s how to attract them into your yard. Put hummingbird friendly plants in your garden. Hummingbird loves specific types of plants. Some flowery plants like trees, vines, azaleas, flowers, butterfly bushes would be great addition to your hummingbird garden. Hummingbirds are good at transferring pollens so keeping flowering plants all year round is a good idea. Colorful feeder. Bright colors attract hummingbirds so choosing the correct feeder may just be the key. Among the colors under the rainbow, red is their favorite and I would not even try to explain why. Keep the insects around. Yes, that is right. Soft bodied insects such as mosquitoes, gnats and even spiders are food for hummingbirds—source of protein hence keeping them at the garden might just be the way to have those beautiful hummers coming back for more. What is the best food for hummingbirds? The hummingbird diet is a complicated one. While many birds will go for seeds, hummers would only stick to nectar from plants or synthetic and insects. These two make up a large part of their food supply. Homemade nectar solution. Using refine sugar mimics the natural sucrose found in flowers so it is a great and practical idea to make some at home. Making plenty (to last two weeks) will save you enough time as well. Natural insects. This is the reason why you should never use pesticides in your backyard – you may unintentionally kill useful insects. Let the hummingbirds do their job of devouring them during feeding time. You keep your yard insect free while keeping the birds healthy. If there’s no available nectar, go for a piece of fruit. The fructose in the fruit might just be the one to keep them healthier. More importantly, an exposed fruit slice will attract gnats and fruit flies, which are also hummingbird food. Buy nectar from reputable bird companies. As much as possible avoid colored ones as they contain food dye, which can be harmful to the birds. Keeping and maintaining hummingbirds in your yard is not an easy thing to do but it is definitely a worthy endeavor. For such, choosing the best food and the best hummingbird feeder among the many varieties should be done very carefully. Once this done, you can simply sit down, relax and enjoy the beautiful colors flying about into your backyard.